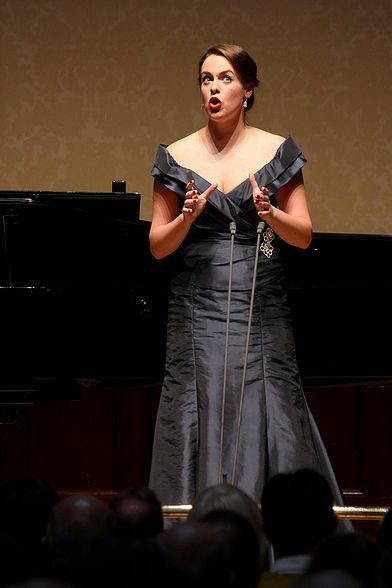 The soprano Gemma Lois Summerfield was the winner of the First Prize and Loveday Song Prize in the 2015 Kathleen Ferrier Competition and has since joined the Opera School at the Royal College of Music. She gave a full-length Sunday afternoon recital on Sunday 10 January 2016 at St John’s Smith Square with her coach Simon Lepper as her duo partner, in a programme of Felix Mendelssohn, Fanny Mendelssohn, Debussy, Jonathan Dove, Sibelius and Richard Strauss. They began with Mendelssohn: four songs by Felix and one by Fanny. The last of this set, ‘Hexenlied’ (Witches’ song) was the most successful, with Hölty’s vivid, treacherous text put across very convincingly, sparks flying everywhere. However, for the previous songs Lepper had played gorgeous, delicate Mendelssohn on the piano while Summerfield seemed to be using this as her audition for Donna Elvira; a permanent fierce look on her face and a fixed stare into the middle distance. She seemed to forget she was among friends. The German language suits her well; the vowels are forward and the diction clear. It was curious that she didn’t choose more songs that showed the voice, and the fire, to better advantage. Debussy’s ‘Ariettes oubliées’ require an idiomatic command of French, a luxury voice and a luxury acoustic. It would be hard to imagine how these songs could work at St John’s, where every note bounced off the marble floor and columns, so that intimacy was the last thing we experienced. Verlaine’s languid text was chopped up, not least with a worrying hole in Summerfield’s voice that we had attributed to nerves at the beginning but by now manifested itself too often. This is a voice in transit. Four Strauss songs, ending with ‘Morgen!’ rounded off the recital. Well executed, and linguistically on safe ground after the French, but we craved more legato in the long phrases, especially as Lepper’s playing was so exquisite. Summerfield needs to learn to work an audience – to show us what the songs mean to her, rather than just writing about it in the printed programme. I felt she should think about ditching some of her old repertoire in favour of new material that works alongside her operatic aspirations, and, like all performers, make sure it works in the space.